Pictionary is one of those games that is often referred to in movies, and often played by a fairly adult audience in the spirit of a game night. It seems that this game is the only game adults seem to know in standard Hollywood flicks, outside of the often negatively portrayed Dungeons & Dragons. Nonetheless, say what you like, there are many people who love playing guessing games, and Czech Games Edition seemed to have caught wind of this. While Pictomania has been out since 2011, the game has recently been revamped to be thrown into the limelight once again. While we weren’t exactly drawn to the game completely, the game does have a fun concept and is open to many players, if they wish to do a small effort in terms of drawing pictures. As far as a Pictionary inspired games goes, the contents of the box looks good enough to do the trick. Don’t expect any overly expensive materials though, as probably only the scoring tokens, the word cards and the guessing/black cards look a bit more qualitative. The card holder is probably one of the worst and cheapest parts of the box, as it simply looks like a piece of thin plastic that is usually used for keeping something in place in a small hardware box. It kind of feels like a piece of plastic they had lying around and tossed into the box, simply to get rid of it. The pencils, the sharpener and the pad of drawing sheets look good enough and it’s actually fun to have differently colored drawing pencils in the box. 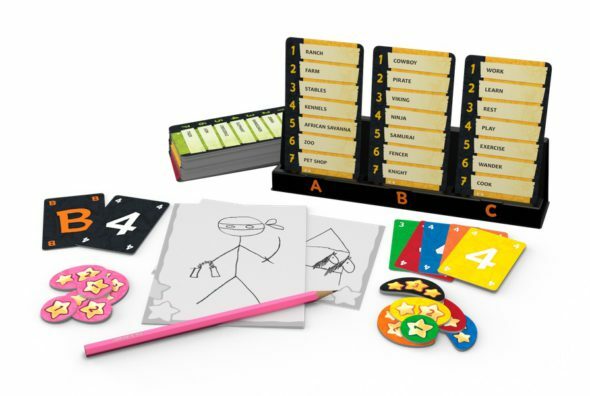 Pictomania is pretty much a Pictionary brawl game, in which players must draw something simultaneously while also having to guess what other players are drawing, this in four rounds. What you draw depends on word cards which have ranging difficulties. The game determines what you have to draw by providing you with a letter and a number card. The letter will indicate the column in which you have to look (A, B or C) and the number card will indicate the row (1 to 7). You will only have to place a number card at the drawing of your opponents to make the right guess, which means that if player one is drawing something from column B and row 4, you’ll only have to place the 4 card at your opponents drawing, face down. Keep in mind that you can only guess after you have finished your own drawing, but that time is also of the essence, as guessing (correctly) first will also determine how many points you’re getting. Players who finish drawing can also pick one of the black score markers that are placed in the middle. You can also opt to not choose a black marker, but this is only useful when playing with the advanced rules where these score markers can count in a negative sense. The scoring system is fairly straightforward. Each player has score tokens lying on the left side of their drawing paper. These will have to be handed out to those guessing the correct word. If more than one player guesses the correct word, the points will be dealt according to how fast the player guessed it, which means that those who were faster will get a higher score token than those that follow after that. If people fail to guess what your drawing is, then your tokens will remain on the left side of your drawing paper, and these will count as negative points at the end of the round. This is probably an incentive to really draw something as accurately as possible. After everyone has received their points, which they place on the right side of their drawing paper, You’ll have to add the tokens on the right side with one another and subtract those you have left on the left side. When playing with the advanced rules, the player who had the most guesses wrong will be deemed the black sheep, and he will have to move his black score token (if he took one) to the left side of his drawing paper and this will count as negative points. This is where the option of picking a black score token comes in. This will happen for four rounds, where each round is played with a set of different word cards (starting off with the lowest difficulty to the highest) and eventually all the round scores are added together. It’s actually hard to discuss the aspects of luck and strategy for a game such as Pictomania. There are different strategies which you can aim for, but most of them simply rely on being able to draw fast, but also rather clearly. If you draw extremely poorly, you might risk that people will not be able to guess your drawings, which means that you’ll be stuck with your score tokens, which count as negative points. But if you are not the greatest artistic talent, and some words are too hard to draw or interpret, you might risk always coming in last if you’re aiming to paint a clear picture, which isn’t all too ideal as well. Most of all, this game should not be taken too seriously which makes it a lot more charming than truly competing in this title. The game pits together people of different skill levels, which is a big advantage for some, while being an enormous disadvantage for others. Pictomania is a fairly fun game, if not taken too seriously. The rules are sometimes a bit odd but the overall concept is pleasant, yet the different skill levels of the players can cause big gaps in how the game flows. If you’re a fan of guessing games, and you can look past the scoring system, and just amuse yourselves with poor or abstract drawings, then this game can get the party started as it’s a small snack sized game that doesn’t take too long to unpack, play and finish.